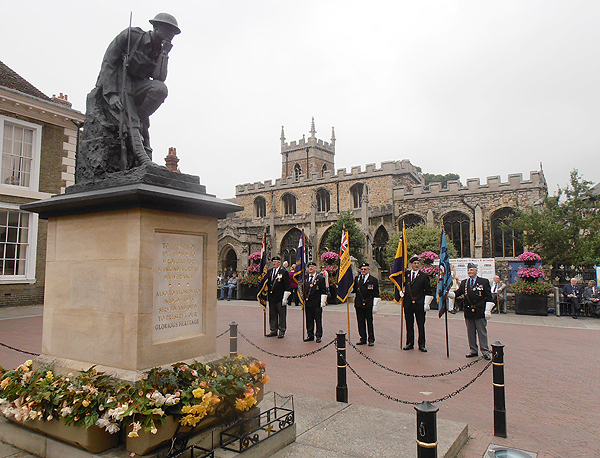 On Sunday 21st July 2013, shipmates from Huntingdon & District and from St Neots & District Branches of the Royal Naval Association (RNA) gathered at Huntingdon’s War Memorial for the Annual Sea Sunday Service. The event brings together seafarers throughout the world; the ‘Mission to Seafarers provides support to the 1.3 million men and women who face danger every day to keep our global economy afloat.1 The service would also be significant for two former Royal Naval ratings, as they would be recognised for their service during the Arctic Convoys of World War Two: Shipmates Jack Millard and Grove Dove (a member of Huntingdon & District RNA). Sunday morning was a warm, but overcast, day. 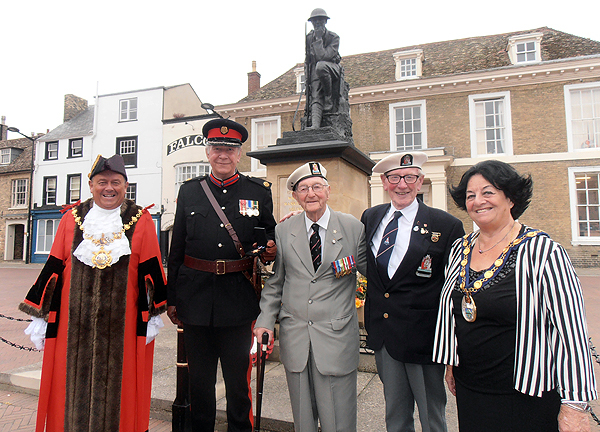 Representatives of the Merchant and Royal Naval forces, joined with members from the Royal British Legion (RBL), Royal Air Force Association (RAFA) and other local organisations, dignitaries from Huntingdonshire District Council (HDC) — which included the Chair of HDC (Councillor Barbara Boddington) and the Mayor of Huntingdon (Councillor Bill Hensley), and the Reverend Andrew Milton, met outside of the Town Hall where the Deputy Lord Lieutenant, Colonel Derek Bristow OBE, briefed us on the day’s programme. 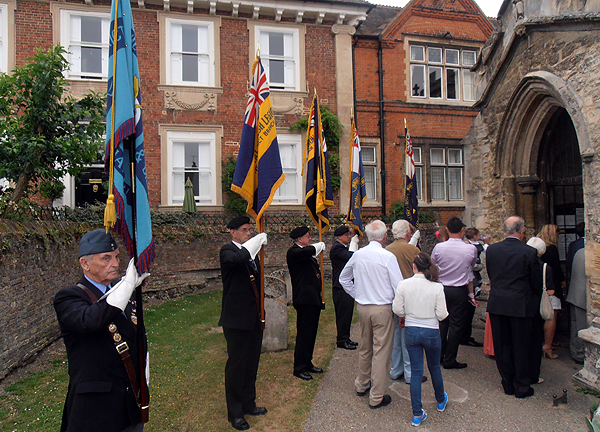 Standards from the RNA, RBL, and RAFA were to be paraded outside Huntingdon’s War Memorial and the Church of St Mary’s and All Saints. 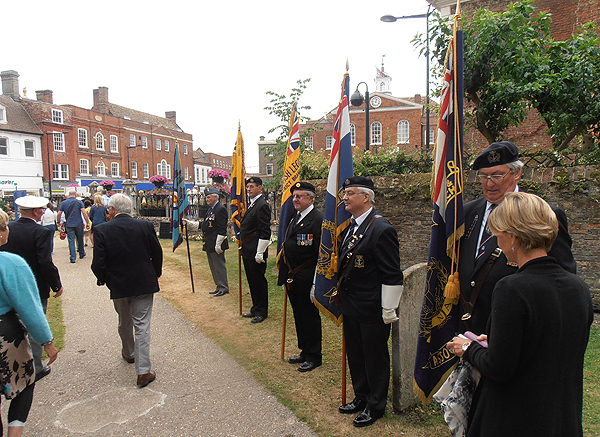 By this time, former seafarers, family, friends, and local residents and visitors had also began to gather around Market Hill. 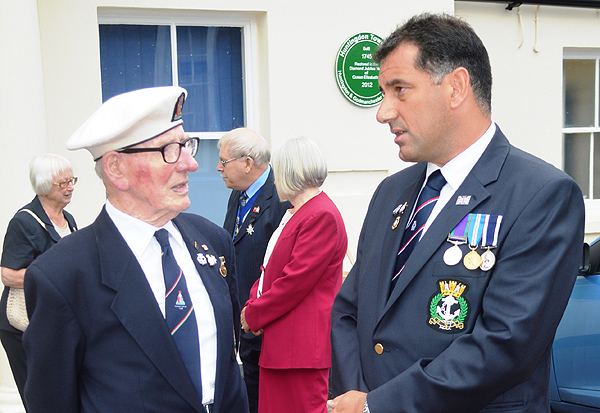 Colonel Bristow usually coordinates the proceedings in his role as CEO Federation of Merchant Mariners, and Chair of Cambs MNA, but he was also carrying out his duties as Deputy Lord Lieutenant in order to present Arctic Star medals to shipmates Jack Millard and Grove Dove. 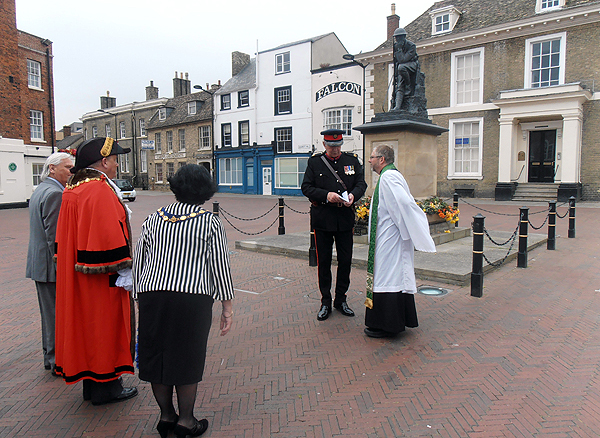 Prayers and wreath laying took place at the memorial before the Standard bearers marched to St Mary’s and All Saints. Standards were again paraded as officials and guests entered the church for the service. Once everyone was seated, the Deputy Lord Lieutenant described the reason for the annual service, he also added that it was his pleasure to be able to represent the Lord Lieutenant in presenting two Arctic Stars to Jack Millard and Grove Dove. Revd Andrew Milton then led the congregation in a prayer which was followed by the first of three hymns that would be sung. Councillor Alan Williams was called forward to read the citation for Jack Millard’s award of the Arctic Star, I was honoured, in my role as Branch Secretary, to do the same for Grove Dove.2 Both veterans were then formally thanked by the Chair of HDC, the Mayor, and the Revd Milton on behalf of the community. A proud day, and well deserved recognition, for Jack and Grove. The service continued with the hymn Eternal Father, Strong to Save 3, otherwise known as For Those in Peril on the Sea. After remembering all seafarers past, present, and future, more prayers and a final hymn was sung before the service concluded. 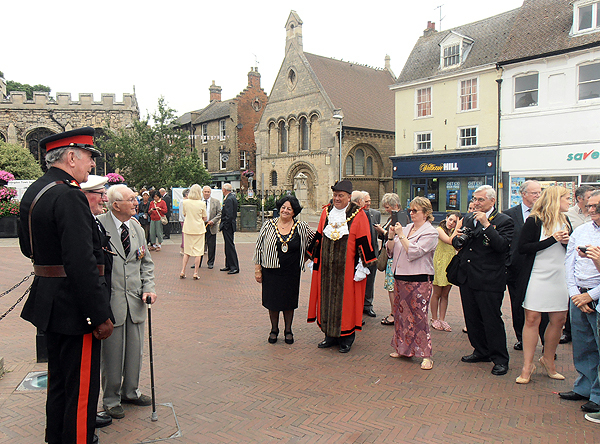 We were then invited to a reception in the town hall, but first we were asked to gather outside to allow family and friends to take photographs of Jack and Grove with the Deputy Lord Lieutenant, Chair of HDC and the Mayor of Huntingdon. 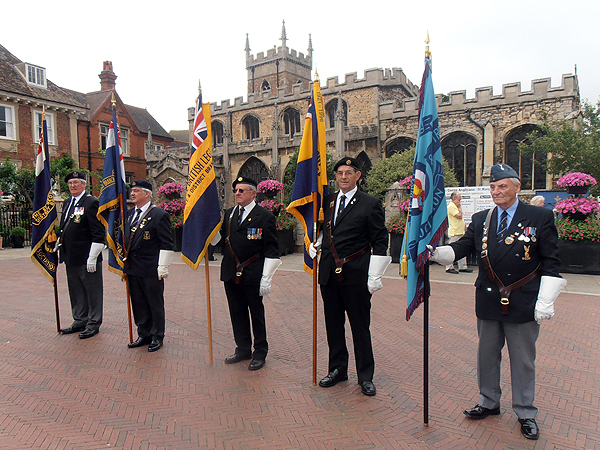 Standard bearers again took up their post outside the church entrance as the congregation moved into Market Square. 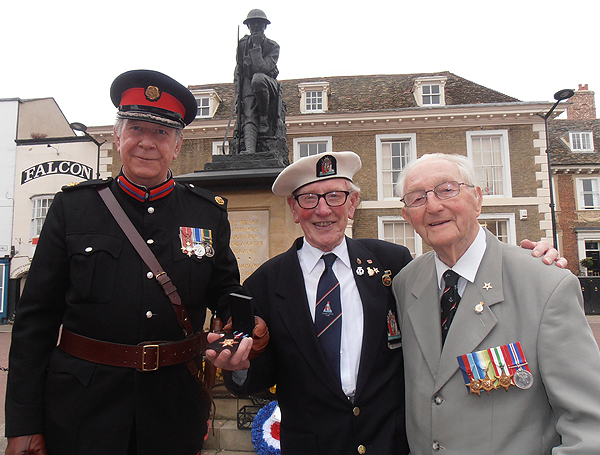 Then there was time for photographs to be taken, clearly a proud day for our veterans. 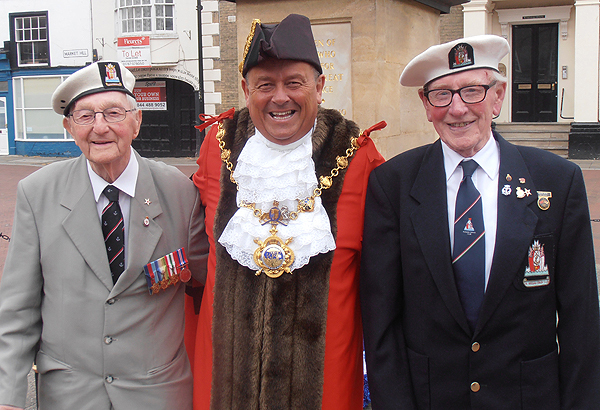 The Mayor of Huntingdon wanted a photograph with Jack and Grove, he then invited them to hos parlour in the Town Hall where — we assume — a small tot was issued! At the reception, all officials and guests were able to chat about their sea experiences and future parades (including a greater collaboration between local Merchant and Naval Associations). 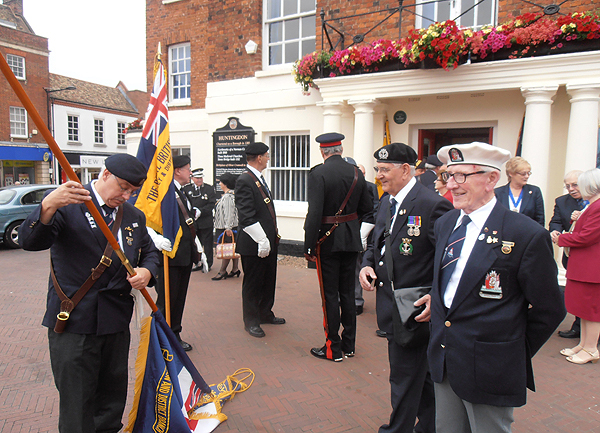 Sea Sunday 2013 was a great success, the comradeship between Huntingdon’s officials, service organisations, and the local community increases with every event we take part in, there will be more to come.